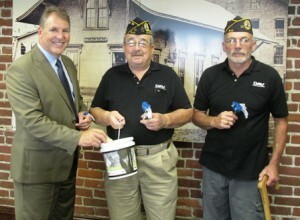 (l to r) In this file photo from July 2015, Mayor Arthur Vigeant, poses for a photo with Ward 2 City Councilor Robert Page and Ron Dalbec, of the Disabled American Veterans, local chapter 82 of Marlborough. Marlborough – Robert D. Page, 75, passed away on Sept. 29, 2015 at Seasons Hospice and Palliative Care Inpatient Center in Milton. He is survived by his wife Elizabeth Ruane; two children, Deborah Page of Tennessee and James Page of Alabama; five grandchildren, Amanda Page, Kristen Kennedy, and Jeremy, Christopher and Aubrey Page and nine great-grandchildren, Trinity and Kaylee Hatchett, Dixie, Dusty, and Rebel, Alyssa, Cailynn and Haleigh Page and Lesleigh Kennedy. He is also survived by two sisters, Deborah Page Block and her husband Robert of Texas and Laurie Clark of New Hampshire; two brothers; Joseph and his wife Marilyn Loscocco of Ohio and Peter Loscocco of Florida; one aunt, Mary Hanna of Pennsylvania and several nieces, nephews and cousins. He was predeceased by his brother-in-law Charles Clark. Born in Newton on Nov. 12, 1940, he was the son of the late William and Nancy Page. Bob was raised in New Castle, N.H. and graduated from Portsmouth High School in 1960. He entered the United States Army where he did two tours of duty in Vietnam. He retired from the army with the rank of sergeant first class after 20 years of service. His last tour was as the army recruiter in Marlborough. He came to love Marlborough and decided to stay. After the army, he was a self-employed general contractor, Page One Carpentry, for 25 years. After his retirement in 2006 he worked part-time as a building inspector for the city of Marlborough. He also became involved in local politics and served as the Ward 2 City Councilor in 2002-2003 and 2014-2015, where he served on several committees. Bob was especially proud to be a veteran and was a lifetime member of ITAM Post 45, VFW of Marlborough, Post 638, where he served as junior vice commander and chaplain, and Salvatore Padula Chapter 82 Disabled American Veterans. He served four terms as commander of the DAV and three years as president of the veterans council for the city of Marlborough. Bob always thought it important to remember and honor our veterans and was coordinator for the Memorial and Veterans days parades for the veterans Council and Labor Day parade coordinator for the DAV. Bob continued his altruistic ways as a member of the Marlboro Lions Club. Over the past 36 years he served the club as president for three terms and chaired many committees. Bob was an avid golfer and “a Friend of Bills” for over 36 years. He was active in his church and the Celebrate Recovery program. He will be remembered for his kindness, generosity, and his sense of humor. His family was most important to him. Although most of them live far away, he made every effort to nurture a loving relationship with each of them. One of Bob’s wishes was to leave this world a better place than when he arrived. He achieved that goal! Funeral arrangements are under the direction of the John P. Rowe Funeral Home Inc., 57 Main Street, Marlborough. A celebration of life will be held on Saturday, Oct. 10, 2015, at 10 a.m. at Grace Baptist Church, 353 River Street, Hudson. Those attending are asked to wear “RED”. Visitation and coffee will be held at the church prior to the service from 9 – 9:45 a.m. Expressions of sympathy may be made in his memory to the Marlborough Lions Club, P.O. Box 383, Marlborough, MA 01752 or the Salvatore Padula Post 82, Disabled American Veterans , P.O. Box 229, Marlborough, MA 01752.